Elements of Movement Practice are: The exploration of movement in and through space; the experience of moving in different rhythms through the “Rhythmic Cycle of Experience”; creating and sustaining relationship to self and others through movement; creating a “holding space” through circle dance for individual and group exploration. Movement Practice is a method supporting self-exploration, self-expression, relationship, and the development of self-awareness. 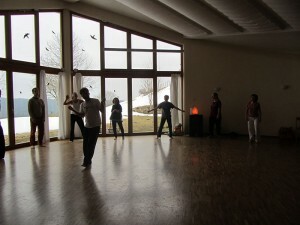 Movement Practice can be considered a form of spiritual practice. Because the core of Movement Practice is the focus on the development of presence, the potential for experiencing the difference between ego-based consciousness and being-based consciousness elevates. As movement, sensing and feeling become the foreground of our experience, the habitual patterns of mind supporting ego activity recede, making direct experience of presence and being more accessible. Various yoga approaches have influenced Johanna’s teaching style, in particular the therapeutics of the Anusara Style, focusing on universal principles of alignment, strengthening the body, and opening the heart. She practices and teaches Yoga as a means towards inner development and the embodiment of presence. In Johanna’s classes each Asana becomes and opportunity to explore the postures from the inside out, moving energy and consciousness through the body rather than simply striking Yogic poses. Johanna’s extensive background as a bodyworker informs her teaching style, as she focuses with great precision on proper alignment. She emphasizes the nuances of how we engage our muscles and joints to create more strength and flexibility in a safe way, supporting the development of radiant inner health. Her skillful use of image and metaphor makes the universal principles of alignment easy to understand and apply. Many students have commented that using Johanna’s approach, they have been able to practice poses previously too difficult for them because of their physical limitations. Johanna’s spiritual background as a teacher in the Diamond Approach weaves deep insight, reflection and guidance seamlessly into her yoga practice. Her teaching is thus transformed into one supporting the development of essential presence, self awareness, and inner healing.